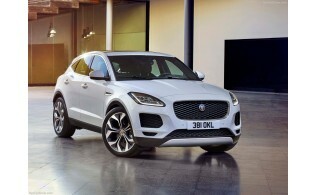 The Jaguar E-Pace is a five-seat compact SUV that packs the design and performance of a Jaguar sports car into a spacious, practical and connected all-wheel-drive vehicle. The E-Pace is the newest member of Jaguar's SUV family following Jaguar's first all-electric SUV, the I-Pace Concept and the World Car of the Year-winning F-Pace performance SUV. The exterior design is inspired by the F-Type sports car and is characterised by the distinctive Jaguar grille, muscular proportions, short overhangs and powerful haunches. Optional 21-inch alloy wheels give the E-Pace a bold and purposeful stance, instantly communicating dynamic agility. Jaguar sports car DNA is also evident in the fast sweep of the roofline and the distinctive side window graphic. The E-Pace will be one of the most connected and intelligent vehicles in its class. The next-generation touchscreen infotainment system connects customers to their favourite apps, such as Spotify through Jaguar Land Rover's InControl apps. Digital connectivity can be found throughout the cabin, ready for every need of the modern family. There are up to four 12-volt charging points and five USB connections as well as a 4G Wi-Fi hotspot for up to eight devices. The Jaguar E-Pace has exceptional interior space for a vehicle in this class. The compact SUV is 4,395mm long with short front and rear overhangs of 882mm and 832mm respectively. Its 2,681mm wheelbase seats five in absolute comfort and yields a generous rear legroom of 892mm while the large luggage capacity of 577 litres is made possible by the vehicle's sophisticated Integral Link rear suspension architecture.